The film that you are about to see was the last 70mm production in East Germany. After 7 feature films and 2 documentaries this production line came to an end. Why did the East German film company DEFA decide to film in 70mm? The DEFA 70mm story is primarily a political one. After the building of the Berlin Wall, East German officials hoped to gain economic independence from the West, and, in the process, to surpass the West as well. This meant that the East constantly had to compare itself with the West. State and party head Walter Ulbricht challenged his country to attain "world class" quality. And world class quality in film production meant 70mm. 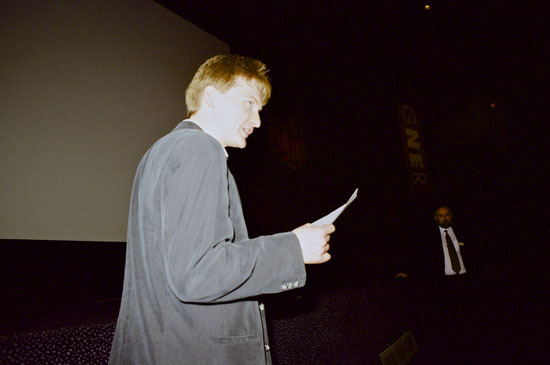 Several people at DEFA, above all Andrew Thorndike, toyed with the idea of creating an East German 70mm film industry. Not only politics, but also a love of film-making influenced this decision. With this idea, Thorndike wanted to lure viewers away from television, and bring them back into the cinema. Where some DEFA films only attracted audiences by giving away free tickets, Thorndike wanted the public to choose to see its own country's major film productions as they did when they flocked to see select Western films. In the 1960s, for example, "My Fair Lady" was the most popular film in both the East and the West, and set a filmic standard. To cut costs and to increase the potential audience, East German productions needed to be made in cooperation with other Eastern states. It was still uncertain whether East Germany could afford to develop 70mm films. Yet in this case Thorndike's influence with Ulbricht was decisive and overrode the critics. Thus DEFA went ahead with 70mm production, parallel to its normal film schedule. However, today there is not enough time to tell the whole story of DEFA 70mm, so let me focus on today's film. The time for a DEFA musical film in 70mm was at hand, although DEFA did have an earlier music tradition. Excited by the possibilities of the new format, director Horst Bonnet accepted the project of a musical film offered him by DEFA. As a theater director, he was a man of the stage. Since 1961, he had directed various productions at all East Berlin music venues. His main speciality included the works of Jacques Offenbach. In Nazi Germany, Offenbach's music had been black-listed, but it experienced a Renaissance in East Germany, particularly due to the productions of director Walter Felsenstein. Bonnet assisted Felsenstein with some of these staging's. He greatly enjoyed the irony of Offenbach's works, apparent both in form and content. "Orpheus in the Underworld" took on a special meaning, as Bonnet produced it in the theater many times. In the summer of 1968, his script was ready for filming and production should have started that fall. However, next Horst Bonnet and his wife were arrested and sentenced to 2 1/2 years in prison, for distributing political leaflets in support of Alexander Dubcek in the Prague revolt. 13 months later he was released, following international protest by artists such as Lord Yehudi Menuhin, Luigi Nono and Benjamin Britten among others. He returned to his work as a director, and DEFA called him back for the Orpheus project. Theater director Bonnet learned new aspects of film making from the set designer Alfred Hirschmeier, who helped him transform his theatrical visions into filmic solutions. Filming finally began at the end of 1972 and it was clear that this would be the last 70mm production by DEFA. DEFA could not and did not want to afford the enormous costs of such a production any more. In addition, Party Secretary Ulbricht was replaced by Erich Honnecker in 1973. At this time, whoever wanted to advance politically would criticise 70mm productions as a waste of resources. These same people today still believe that DEFA's 70mm experiment was one of the biggest mistakes of the East German film industry. Due to this negative opinion, 70mm prints were archived carelessly. In some cases, no 70mm prints exist, as officials believed that 35mm was more than sufficient. 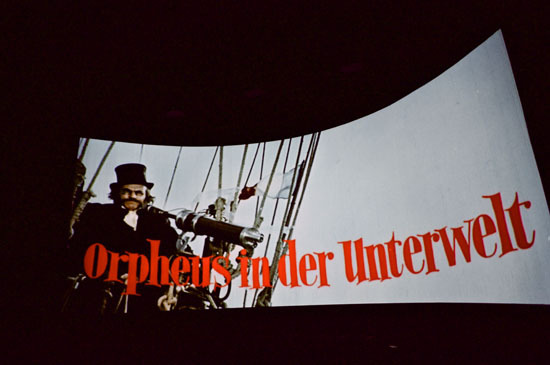 The only 70 mm print of "Orpheus in the Underworld" that exists today is the one you are about to see. Unfortunately, in the first reel, the section that immediately follows the credits was so badly damaged that it had to be removed. Despite this, and in order to give you a full impression, we will show the damaged section first, but in 35mm mono sound. This is the section that begins directly after the credits. 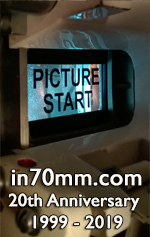 After that we will start the 70mm version, so that you can see as much as possible. You will see where the damaged section was. The director told me that he had a lot of fun making this film, I hope you have as much fun watching the film. Enjoy the show.